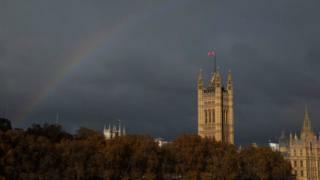 MPs need to stop "chasing rainbows" when it comes to resolving the Brexit impasse, according to the British Chambers of Commerce (BCC). Brexit uncertainty is already doing "real world damage" to the UK economy, the BCC's Adam Marshall told the group's annual conference on Thursday. He also said leaving the European Union in a disorderly way would be a "flagrant dereliction of duty". It follows an unprecedented move by MPs to seize control of the Brexit process. However, none of the eight proposed Brexit options put to MPs on Wednesday evening secured a clear backing in the series of votes aimed at finding consensus. Mr Marshall, the BCC's director general, told the event that Westminster had left business "frustrated [and] angry". "You have focused on soundbites not substance, tactics not strategy and politics not prosperity," he said. He warned that Brexit uncertainty was already creating a "growing list of business casualties" and "in many parts of our economy, real world damage is happening right now". This included orders lost to competitors, contracts un-renewed, investments cancelled and queries from customers that "simply can't be answered". Mr Marshall also said jobs were likely to be lost, due to the slowing global economy as well as the impact from Brexit. "Business want to get on and escape from the gravitational pull of the Brexit black hole that has sapped energy, investment and business confidence for far too long," he said. His comments echo those from other business groups. On Wednesday, the Institute of Directors said its members were "angry and frustrated" and it called on "politicians of all parties to listen to the voice of businesses as they make vital decisions on the path ahead for Brexit". And last week the Confederation of British Industry and the Trades Union Congress issued a rare joint statement calling on May to change her approach to Brexit. The BCC isn't pulling its punches, calling the political impasse a "Brexit black hole" and a hard Brexit a "dereliction of duty". The trouble is that one of the reasons the BCC and its members are angry and upset is that it seems apparent to them that politicians have stopped listening to their opinions. With the prospect of a no-deal Brexit far from dead, business organisations large and small are furious at what they see as political incompetence and fantasy thinking at all levels of government and across the political spectrum. Hard-headed business leaders are aghast. As Adam Marshall, the director general of the BCC, put it, "this no way to run a business let alone a country", and I suppose he should know.